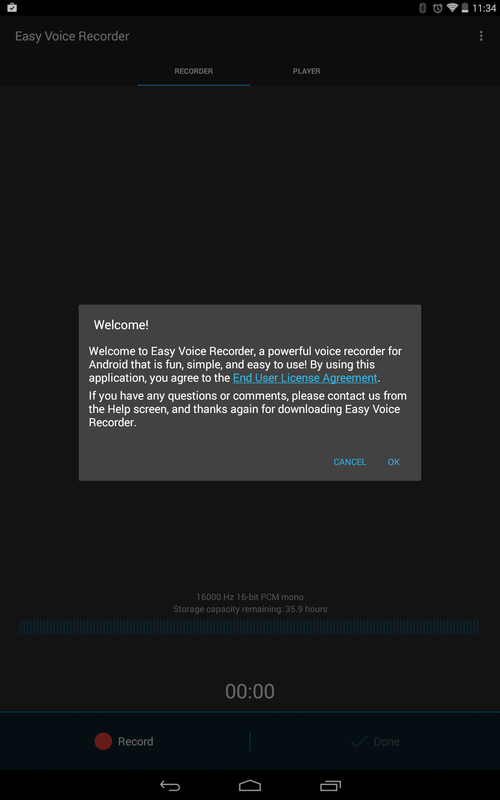 What is Easy Voice Recorder? 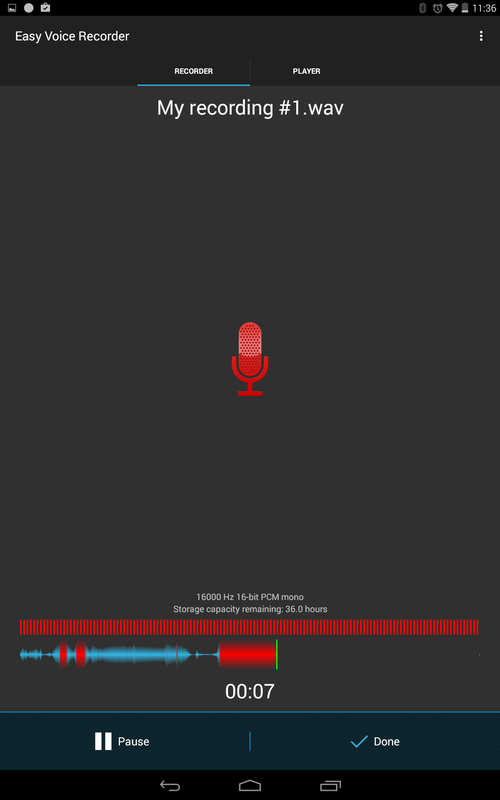 Easy Voice Recorder is a simple, yet high-quality audio recorder for Android. It would be hard to make an easier to use audio recorder. Perhaps impossible without controlling it telepathically. The hardest part of using this app is the very first launch. It has something not seen in many apps these days, an end user license agreement. A brief look doesn’t show anything too sinister, but why? It’s an audio recorder, do we really need to sign an agreement? Aside from that, it’s incredibly easy to get started. There is a giant microphone, just tap it and start recording! Easy Voice Recorder, despite its name, does have quite a few useful options. It includes its own built-in audio player and the app allows for external audio players as well. 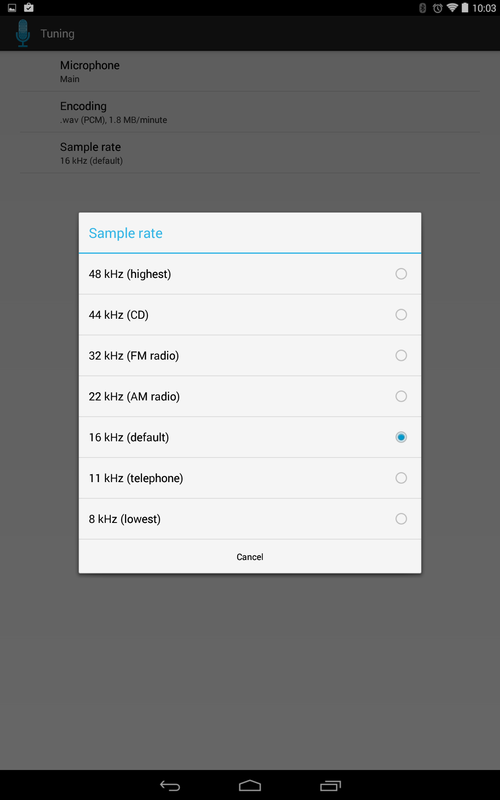 Other settings include choosing from a limited selection of audio formats, .m4a, .wav, .3gp and the sample rate. One of the coolest features is the ability to pause and resume recordings. Want to interview someone, but don’t want to include all that silence that will invariably occur? This Android app is for you! The biggest gripe is the difficulty in naming recordings. Yea, it’s not that hard, but it’s annoying. There are two options. After making a recording, click the pencil in the upper right corner, or go to the player tab, long press on the file to select it and then click the pencil in the upper right. Not terrible, just not simple. Simple. That’s all that’s needed to describe this interface. There are“record” and “done” buttons on the bottom of the screen, a couple tabs on top and a giant microphone in the middle. When recording, there is even a monitor to watch for clipping. The player tab has the recordings in the main section and the traditional play/pause/previous/next buttons at the bottom and a seek bar. The only obnoxious thing is the ads, which can be removed with a pro version that also unlocks other features. Easy Voice Recorder is, as should be evident from its name, easy to use. There are a few settings that can be tweaked for sound quality, but not nearly enough for professional audio. It’s clear that this app was designed for quick and dirty voice recording. 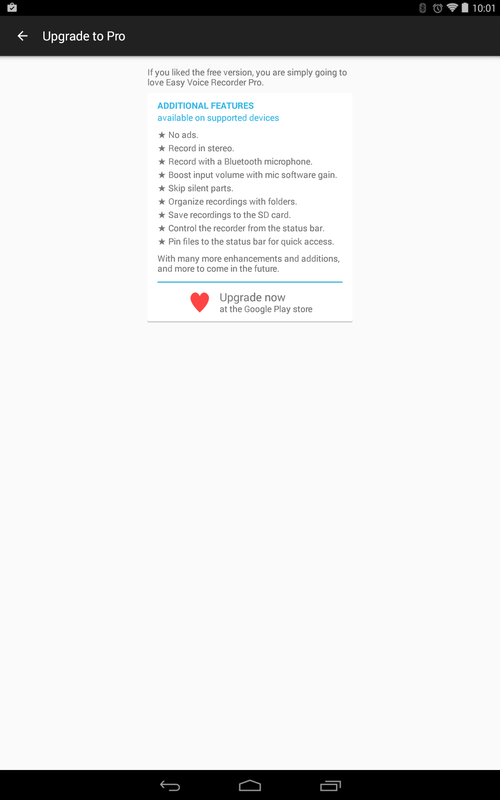 It should also be noted that the actual sound quality of the recordings could not be reliably tested on Android 4.4.4. 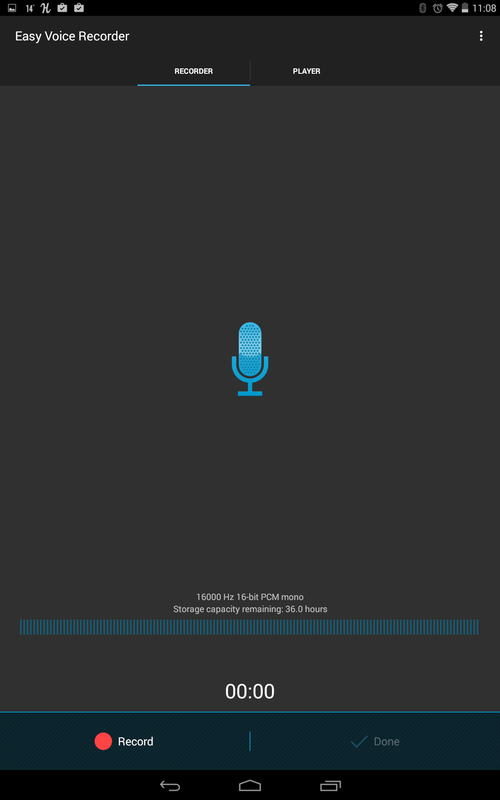 Android tablets are notorious for having lousy microphones and Android 4.4.4 doesn’t make it easy to use an external USB mic such as the Blue Yeti Pro. However, audio quality sounded fine when taking all of this into consideration.